Applying a filter to a pivot table is different from adding a filter control to a pivot table widget in a dashboard (see Creating DeepSee Dashboards). A filter control enables another user later to filter the data. You can add filter controls to a widget that displays a pivot table that has its own filter. Filters restrict the set of records that the system uses. Filters can be either simple or advanced, and you can add any combination of filters to your pivot table. Later sections describe how to create these filters in detail. You can drag and drop an individual member to use as a filter. To do so, drag and drop a member to Drop filter here in the Filters box or to the filter bar. Select All to see all members of this level (that is, perform no filtering with this level). Select one or more members to filter the pivot table to use only data for those members. You must press Ctrl while selecting multiple members. Select one or more members and select Exclude Members to filter the pivot table to use data for all members except for the selected ones. In each drop-down list, select a member. 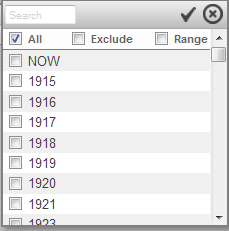 For a time level, the list of members includes NOW, which always refers to the current date. For other options, see Filtering Data, in the chapter Using Dashboards in DeepSee End User Guide. When you are done, click the check mark button to accept the selections. Or click the X button to discard your changes. When you save the pivot table, the Analyzer saves any selections in the filter control. When you next open the pivot table, the Analyzer redisplays the filter control as you saved it. Initially, the advanced filter editor uses the first level (considering alphabetic order) defined in your subject area. Click YearSold, which enables you to edit this part of the expression. Optionally type a string into the search box and then click Search. This is useful if the cube has a large number of levels. The end of the drop-down list may include measures; if so, see Filtering the Data by Measure Value, later in this chapter. Click IS, which enables you to edit this part of the expression. In the left area, click IS NOT. As soon as you do, the expression is updated. In the left area, click the Search button under Select a value to display a dialog. The resulting dialog displays a set of members and options. Optionally type text into the search box and press Enter; this restricts the set of members listed in the dialog. The list of values also includes all searchable measures (see the next section) and all pivot variables (see Defining and Using Pivot Variables, later in this book). Select members and options by selecting their check boxes. Click the check mark button in the upper right hand corner of the dialog. As soon as you do, the expression is updated. Alternatively, you may enter an MDX key by selecting the MDX Key option. This advanced filter is equivalent to a simple filter. Typically you would now add another condition or a branch that contains other conditions. Click AND, so that you can edit this item. Optionally, in the left area, click OR. As soon as you do, the expression is updated. Edit this condition in the same way that you edited the first one. Or add another condition or a branch that contains other conditions. Note that you can undo any change. To do so, click Undo. The advanced filter editor initially uses the first level (considering alphabetic order) defined in your subject area. Click Age Group, which allows you to edit this part of the expression. Note that the list of values also includes all pivot variables (see Defining and Using Pivot Variables, later in this book). Click the measure that you want to use. Click the operator, which is an equals sign (=) by default. Click the comparison value, which is 0 by default. Now the editor displays a box into which you can type a new value. Type a value and then click Apply. 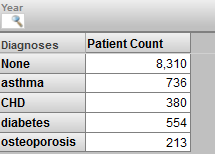 This filter selects all patients whose test score is 65 or higher. A named filter is saved with the subject area. You can use it in multiple pivot tables and in filter controls on dashboards. Make sure that no named filter is currently selected. Click the Named Filter button in the Model Contents pane. For Filter Name, type a user-friendly filter name. For Description, type an optional description. 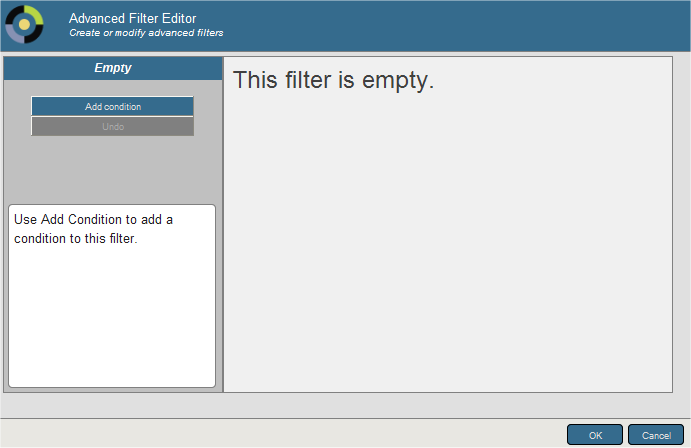 The rest of the dialog box is the same as the Advanced Filter Editor. For details on the rest of this dialog box, see Adding Advanced Filters, earlier in this chapter. When you are done, the Model Contents pane displays the filter within the Named Filters section. Because a named filter can be relatively complex, it can be useful to define appropriate named filters for use on dashboards. If you do this, users of the dashboards can filter their data more easily. 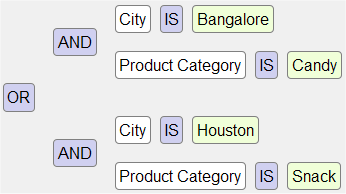 Select the named filter in the Model Contents pane. Click the Named Filter button . For details, see Adding Advanced Filters, earlier in this chapter. To use a named filter, drag and drop it from the Model Contents pane to the Filters box. Or double-click the named filter; then it is added to the Filters box. 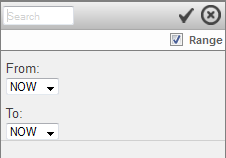 To disable a filter, clear the check box to the left of the name of the filter in the Filters box. To remove a filter, click the X to the right of the name of the filter. This section describes how the system combines filters. DeepSee uses a logical AND to combine all the items shown in the bar above the pivot table. If this bar displays a level, and if you have selected one or more members of that level in the drop-down, those members are combined with a logical OR. If you have also applied advanced filters, those are combined with the other filters via logical AND. Depending on the form of the combined filter, DeepSee might perform axis folding. This phrase refers to the process of combining multiple filters (a filter is considered to be a query axis). Axis folding means that if a given source record has a non-null result for each slicer axis, that record is counted multiple times. For details on when this occurs, see Axis Folding in the appendix How the DeepSee Query Engine Works in the DeepSee Implementation Guide. This section describes how and why to find the key identifier for a member. Names are not necessarily unique. When you create a filter by drag and drop actions, DeepSee automatically uses the member key rather than the member name. When you specify the default value for a filter control on a dashboard (as described in Creating DeepSee Dashboards). When you specify the initial value for a filter control via a dashboard URL (as described in the DeepSee Implementation Guide). It is also best practice to use the key when you refer to a member in a pivot variable. Drag and drop the member to the Filters box in the Analyzer. Click the Display Query button on the toolbar. The %FILTER part specifies the filter. The [DocD].[H1]. [Doctor].& part is the complete member identifier for this member. The key for this member is 32. Drag and drop each of the members to Rows. If this level has a property, drag and drop that to Columns. The property values are typically different for each member, and you can use the information here to determine which member to look at. According to this pivot table, the first Sam Presley is not in any doctor group, and the second one is in doctor group II. You can use this information to determine which member to look at. In other cases, it might be necessary to display a detail listing in order to correctly identify the desired member.